Preheat the oven to 180°C, gas mark 4 and bake the chipolatas for 15 minutes until nicely browned. Remove from the oven and reserve. Turn the heat up to 220°C, gas mark 7, pending the arrival of the assembled toad-in-the-hole. Mix the flour with a pinch of salt and a little freshly ground black pepper in a large bowl. Stir in the eggs, then slowly whisk in the ale and milk. Take the muffin tin and pour a dribble of olive oil into each mould. Place the tin in the oven for 5 minutes until the oil is smoking hot. 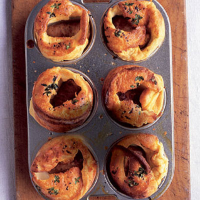 Remove it carefully from the oven and immediately pour the batter equally intp the muffin moulds. Push half a chipolata into each mould and sprinkle with a few leaves of thyme, followed by a grinding of black pepper. Bake for 15 minutes without opening the oven door until fully risen. The spiritual partner to this dish is a pint of malty English bitter, with enough hoppy bitterness to reign in the fatty richness of the sausages.